It’s hard to follow a recipe exactly. I once did a stint testing recipes as it sounded like fun, I wanted exposure to a new range of recipes, and, mostly, I was curious to see if they would work using local ingredients. What I discovered was that testing recipes requires the ability to follow directions, a greater challenge than I’d first realized. This Savory Sausage and Kale Tart is a case in point, serving to remind me how difficult it is to write a recipe in the first place. Here’s a sampling of the many decisions made along the way in following another’s recipe. Depending on the season, most of what we cook begins with what’s in the garden. The mild weather this December has left us with an abundance of fresh kale, and while searching for a new recipe to use it in, I came upon one for Sausage and Kale Dinner Tart. A quick scan of the ingredient list showed that I had most everything already on hand, and what I didn’t could be easily substituted. This is where I’d usually start to veer wrong. Precision is a requirement in testing recipes, and prohibits much swapping of ingredients, a necessity when cooking locally. 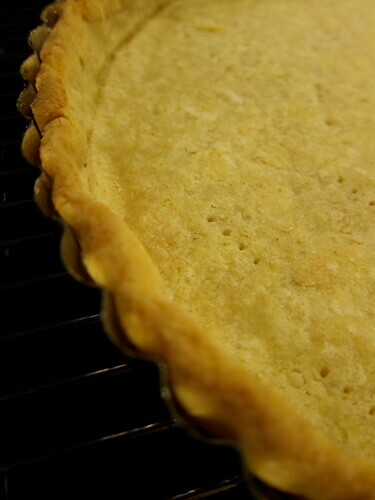 Starting with the tart dough: The recipe calls for a 1½ cups of all-purpose flour. Whenever possible, I replace some of the white flour with about a quarter to a third locally-grown whole wheat flour. The amount of water then needs to be adjusted to compensate for how much more the whole wheat flour absorbs. The original recipe further directs wrapping the dough in plastic wrap to let it rest; to avoid using plastic, I just place the dough in a covered container before putting it in the fridge. In blind-baking the tart shell, if the dough sticks to the parchment when lifted, I give it another 5 minutes before removing the parchment and weights. Recipes often forget to mention this tip: Make sure to press the dough into the pan and avoid stretching it to fit, or it will shrink during baking and leave you with a smaller tart shell than what the recipe calls for. On to the tart filling: I used red onions instead of yellow; they lent sweetness and color to the finished tart. For the cheese, I used feta and thought it would go well with the kale and sausage. Basil’s out of season, and some chopped marjoram took its place; thyme or oregano are also good choices. I neglected to dry the kale after washing it, which resulted in more liquid in the pan than could be cooked off. To avoid the tart from becoming soggy, I left most of the pan juices behind. Another tip: Remember to remove the casing before browning the sausage. 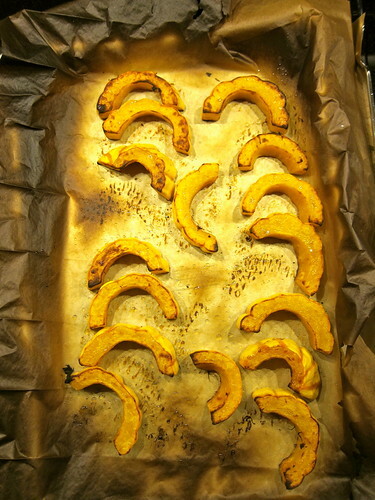 To go with the suggested accompanying salad, I roasted up a Delicata squash. The slices looked a little anemic, and were further browned under the broiler. The Delicata ended up nicely caramelized and was delicious with the tart. However, by the looks of it, we were lucky the parchment didn’t catch on fire. Note to self: Remove the parchment before broiling. In the end, cooking is much like driving a car, calling for constant adjustments to the actual conditions encountered along the way. This satisfyingly flavorful tart was forgiving of my substitutions, including doubling the amount of sausage only because it was what the package held, and adding another egg to help bind the extra sausage. The next time, I’d try using lard instead of butter in the crust, or brush the shell with some garlic-infused olive oil. Some other variations to consider: add a diced apple or red bell pepper to the filling; flavor it with nutmeg or lemon zest; some cubed potato or winter squash in place of the sausage; a small handful of toasted pine nuts wouldn’t be out of place and make it your own. – Cut the butter into small cubes. 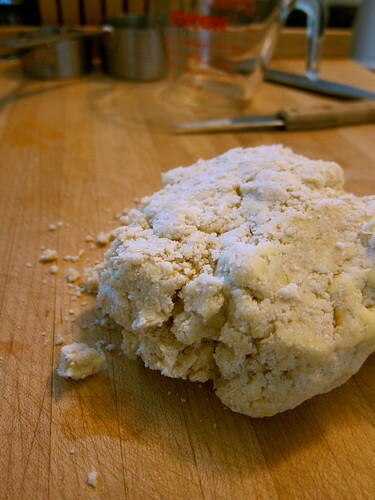 Combine butter and flour in the bowl of a food processor, pulse until butter is pea-sized. Slowly drizzle water through the top of the food processor while pulsing. Enough water is added when dough sticks together when pressed. Remove dough from processor and shape gently into a disc. Place disc in covered food container and chill for at least 30 minutes. – Remove dough from refrigerator, and place disc on a lightly floured board. Roll dough into a circle 12 inches in diameter. Place dough in 10 inch tart pan with removable bottom. Dock dough with a fork. Let dough rest another 30 minutes in the refrigerator. – Heat oven to 400°F. Lay parchment paper or foil over dough and fill with beans or pie weights. Blind bake the tart shell (with pie weights) for 20 to 25 minutes. Then remove parchment and weights and bake an additional 5 minutes until the crust begins to brown. Remove from oven and set aside on cooling rack. – Heat oil in pan on medium heat. Add onion and garlic and reduce heat to medium-low. Cook until onions are soft and light brown. Season with salt and pepper. Remove onions from pan and set aside. Increase heat to medium and add sausage to pan. Brown sausage and break into small pieces. Remove sausage from pan and set aside. Drain all but 1 tablespoon of oil from pan. – Add kale with a splash of cider vinegar to pan. Scrape any bits from the pan and cover. 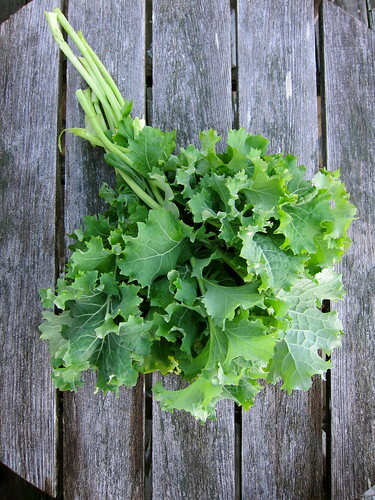 Cook 3-5 minutes, until kale is wilted. Season with salt and pepper. If kale is still very wet, cook uncovered for a minute or two. The overall mixture should be fairly dry. 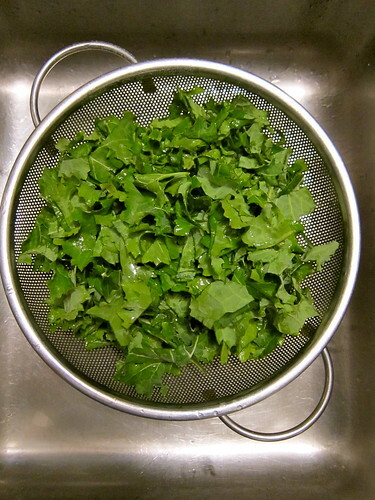 Remove kale to a large bowl. Toss cooked kale with cooked sausage and onions. Allow to cool for 5 minutes. Toss mixture with herbs, eggs, and feta. Season with salt and pepper. 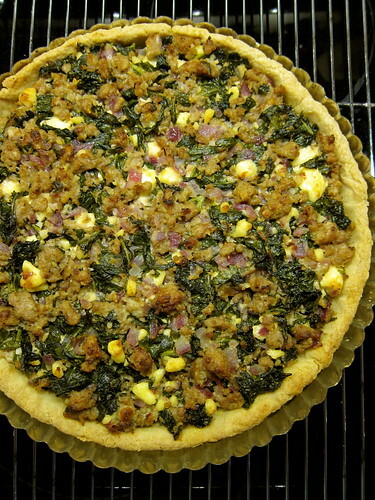 – Spoon sausage and kale mixture into cooked tart shell. Be sure to evenly cover the bottom of the tart shell. Bake the tart on a baking tray for 10-15 minutes at 400 degrees. Remove tart from oven when the filling is set and the tart shell is nicely brown. Cool tart slightly on a wire rack before slicing and serving. Adapted from My Pantry Shelf, via Food52. 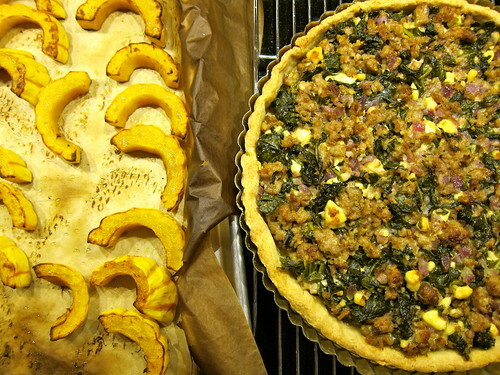 Local ingredients: Butter, feta and whole wheat pastry flour from Brookford Farm; hot Italian sausage and eggs from Meadow’s Mirth; red onion from Wake Robin Farm; kale, garlic and marjoram from the garden. This entry was posted in cooking and tagged cheese, kale, sausage. Bookmark the permalink. The squash delicata looks pretty yummy and I’m a sucker for anything with kale. Too bad I’m horrible at working with dough – otherwise would have loved to give this a try, looks great. I have to admit to being a very diligent recipe follower at times, but at other times I will substitute all over the place. It tends to depend on my level of concentration and whether I have sufficient bench space available for the book as well as what’s in the garden at the time. The first time around, I try to hew to a recipe as closely as possible but often go rogue despite my good intentions! A few days ago, one of my pot holders accidentally ended up in the oven and caught fire. Not to self: make sure it doesn’t happen again. I love roasted delicata squash. I have to be careful when I make it because I can eat one without problems. That’s a lovely tart!